Ampco was founded in back in 1961 and prides in itself on it’s long history of quality, service and innovation. In 2016 Ampco was acquired by AJW’s parent company, Fifty Doors Partners, LLC. This acquisition lead to the legacy bathroom stalls product line being rebranded as Ampco by AJW. AJW is a top manufacturer of stainless steel washroom accessories, so it makes a great complement to the Apmco bathroom stalls product line. Ampco bathroom stalls are available in six different material choices and that offer a large variety of color options. 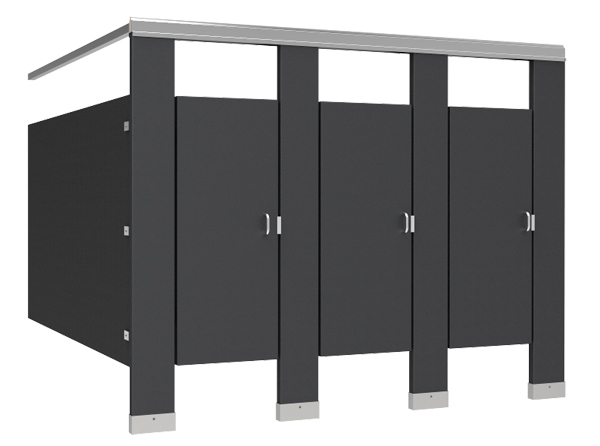 Ampco’s restroom stalls have four different mounting styles available. Powder Coated Steel Bathroom Stalls – These toilet partitions are long lasting and budget friendly. With one of the toughest pain finishes out there, it protects the partitions from the effects of impact and humidity. A wide variety of colors are available and they carry a two year warranty again rust. Mounting options are available in overhead braced, floor mounted, floor to ceiling and ceiling hung mounting. Stainless Steel Bathroom Stalls – These restroom stalls come in a #4 brushed satin finish. With a great look and strength, this material is great for hospitals and retail stores. It has a five year warranty against rust and offers mounting options in overhead braced, floor mounted, floor to ceiling and ceiling hung mounting. HDPE Bathroom Stalls – These restroom partitions are 1” thick plastic and available in a variety of colors and provides a solid color throughout the material. It is a great product for high traffic areas such as schools, swimming areas, and parks. It is water and graffiti resistant and good for high humidity locations. This material carries a Class A fire rating and is virtually maintenance free. Ampco’s solid plastic partitions carry a 25 year warranty against cracking and breakage. Mounting options are available in overhead braced, floor to ceiling and ceiling hung mounting. High Pressure Laminate Bathroom Stalls – These bathroom partitions use a GP-50 high pressure laminate and 45 pound particleboard to create beautiful plastic laminate bathroom stalls. A large variety of solid, pattern and designer colors are available. Some colors offer quick ship options for speedy delivery. Plastic Laminate is bonded to help resist water and it carries a two year warranty against delaminate. Mounting options are available in overhead braced, floor mounted, floor to ceiling and ceiling hung mounting. Phenolic Core Bathroom Stalls – These toilet partitions feature a compact laminate, which provides design flexibility, durability and strength. A wide variety of colors are available to match your restroom décor and they are also available in Formica and Wilson colors. These panels are feature a virtually indestructible core. Heat, wear, corrosion and chemical resistance makes it a great material choice for institutional environments. The partitions offer a 25 year warranty against delamination with mounting options available in overhead braced, floor mounted, floor to ceiling and ceiling hung mounting. Solid Surface Toilet Partitions – These restroom stalls are produced with a polymer based artificial stone that looks similar to granite, marble, or stone. These partitions features a Class A fire rating and they are resistant to water, moisture, and heat as well as an anti-bacterial property that is non-toxic and non-allergic. They are a great low maintenance product at an affordable price. Because of its solid surface, this material is great for hospitals, restaurants, and hotels. The partitions include a five year warranty against defects and offer mounting options in overhead braced, floor to ceiling and ceiling hung mounting. Bathroom Stalls are available in four different mounting choices and a wide variety of material choices and colors including Solid Surface with an anti-bacterial property. Partition replacement parts and hardware are readily available and in stock to ship quick. AJ Washroom Stainless Steel bathroom accessories are also available to ship out within 1-2 days. Partitions products can help with your LEED credits on building projects that are LEED certified. AJW is a member of the United States Green Building Council to help promote green buildings and help lead to a sustainable future. Each Ampco by AJW material carries LEED Credits based on the material properties. All materials contain recycled content. Stalls offers a large selection of continuous hardware and a variety of materials for hardware including aluminum and stainless steel. Ampco has manufacturing plants in five locations in four different states including Florida, Texas and Washington State. Products generally ship within approximately 1-2 weeks depending on material type and color ordered. A quick ship option is available on certain products and colors. If you’re renovating your existing restrooms or creating a new stall layout, we can help with design, material choice, layout, and pricing.